Grand Reef Casino is built on a Playtech platform and offers a variety of bonuses, including a $25 no deposit bonus exclusive to Online Casino Listings. The site also offers customer service via live chat. Craps can be intimidating for the novice gambler. We bring an extensive guide on playing online craps and mastering the game in no time at all. This is one of the most exciting games online and we make it simpler and more accessible to everyone. Craps is a game that players can really get excited about, and not just because it offers great odds. Players who are looking to play online craps, need to look no further than our list of top ranking craps casinos. This is where you’ll find the best online casinos in the world that will offer you the biggest bonuses, the most secure playing platforms and the friendliest customer service. At first glance, the game of craps might seem like a daunting one, but it is actually one of the most exciting games that any casino has to offer. If you want to play online craps, don’t be intimidated by the somewhat confusing layout or the multitude of betting options that you have available. You can learn how to win at craps in no time at all if you just focus on what you need to know and try to forget about everything else until you are comfortable with the basics. The first thing you need to know is that there are a number of bets that you can make when you play online craps, but you can start playing by getting to know just a couple of them, and that includes the Pass Line bet. Before you can start playing, you’ll need to take note of the minimum bet on the table, which is generally $5 or less. You will then get a turn to roll the dice, along with the other players, although you’ll bet on everyone’s roll. If you don’t want to roll the dice, you have the option to pass. The players continue to roll until they roll a 7. The numbers that are calculated by a roll refer to both of the dice; this means if you roll a 3, it is the numbers on both dice that add up to 3. 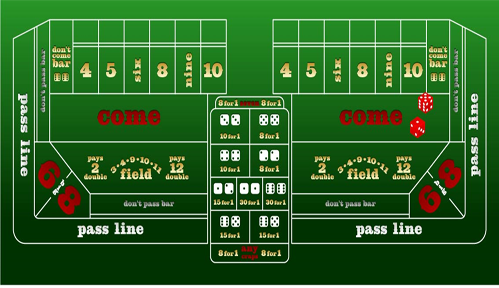 Most players stick to betting on the pass line when they play online craps, as this is the easiest option to learn. Keep in mind that this bet has a house advantage of 1.41%, which isn’t much, but is still enough to work against you. When the dealer is ready to accept bets, you will then need to place your bet on the pass line marking, and the shooter will then roll the dice. The outcome of the roll will depend entirely on the numbers displayed on the dice. If the total on the dice adds up to 7 or 11, you win the round and the shooter will roll again. If they roll a 2, 3 or a 12, you will lose the round and the shooter will roll again. The numbers 4, 5, 6, 8, 9 and 10 means you’ll enter into the point round. In the event that you win a round, your bet will be matched by the dealer, but if you lose, you’ll lose your bet. The Pass Line bet happens to be the most popular type of bet in online craps, but it is by no means the only one. It is also the safest bet, however, as it takes a lot of the strategy out of the game of online craps and allows players the chance to focus on enjoying the experience. The more a player knows about their other options when they play craps online, the more informed they’ll be when the time comes to pick their bets. The Don’t Pass bet cuts down the house advantage to 1.36%, which is one of the things of oonline craps that make it so appealing. If you bet the Don’t Pass bet, you are basically betting that all the other players are going to lose, which is why it isn’t a very popular option. If a 7 or 11 signifies a win in the Pass Bet, it signifies a loss in the Don’t Pass bet. The 2, 3 and 12, on the other hand, signify a win. Come bets are very similar to pass bets, although they take place on a shooter’s second round. If the shooter rolls a 7 or 11 again, the player will win the bet. If another number comes up, the bet is then placed in a numbered box and the shooters will need to roll that number before another 7 is rolled for you to walk away a winner. There is the same similarity with the Don’t Come bet and the Don’t Pass bet; if the shooter rolls a 2, 3 or 12 again, the player wins. If another number comes up on the Don’t Come bet, the bet will be placed in a numbered box and the player will bet that a 7 will come up before that number. These are some of the simplest bets that you can make when learning how to win at online craps because there are a number of more complex options available to players. For instance, the Craps Odds bet offers no house advantage at all, but it can only be made once when all of the previously mentioned bets have been made. When it comes to putting down your bet, you can choose to double the original bet that you made or opt to bet on the Come bet. Most people opt to bet on a 7 simply because of the various ways that players can roll this number (6,1; 2,5 etc). Place bets are simple enough to understand. Players simply need to pick a number that they think will come up before the 7 and bet on it. These sorts of bets are only available for specific numbers, including 4, 5, 6, 8, 9 and 10. These are a few examples of the bets that can be made in a game of online craps. Some of the other options include Buy bets, Lay bets, Big 6 or Big 8 bets and Field bets. Getting to know as much as possible about the game of online craps, can go a long way to making this game that much more enjoyable, not to mention increasing your odds of walking away a winner.